Infamous for a series of high-profile hacks on Sony, Nintendo, the PBS, FBI affiliates, LulzSec claimed on Wednesday its responsibility for hacking the website for the U.S. Central Intelligence Agency. Over the weekend, a portion of the Senate website was hacked, and the same website was targeted again on Wednesday. LulzSec was unable to access proprietary data due to a firewall, the Senate acknowledged today. 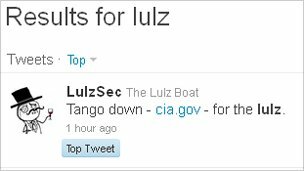 The hacker group tweeted an hour ago, "Lulz Security, where the entertainment is always at your expense, whether you realize it or not. Wrecking your infrastructures since 2011." Its Twitter followers have swelled to nearly 160,000. A CIA spokeswoman told the Associated Press that officials are investigating the reports. Such outages are often the result of DDoS, or distributed denial of service, attacks. The assaults generally require little skill to carry out.